Brexit - The Role and Responsibility of Civil Society & What is the scope for Brexit to shape and (re)define the next-generation of British-German relations? January 14, 2019| 12:15 | JO 1, Johannisstr. BREXIT - 'An Epic Act of Self-Harm' or an Act of National Salvation? From September 28-30th, the Chair of English, Postcolonial & Media Studies and Open University will be co-hosting a unique collaborative Symposium. Compiling the very first Cambridge History of Black and Asian British Writing, editors Professor Susheila Nasta (Open Univesity) and Professor Mark Stein (Münster) have invited their contributors to a three-day research and cooperation workspace through which the writing process shall be enhanced and productively facilitated. The Cambridge History of Black and Asian British Writing will be the first coherent written historical account of its kind bridging nearly 300 years of Black and Asian British literary production. Chronologically moving forward, the History’s three sections, “Early formations: 18th to early 20th century”, “Uneven histories: Changing landscapes in the twentieth century”, and “Writing contemporary Britain: Post-ethnic and transnational imaginaries” will guide contributors and readers through the different phases of these writings. Being published in 2018, the book will not only inscribe past and present Black and Asian British literatures into historiography but function as a vantage point for future scholarly endeavors. 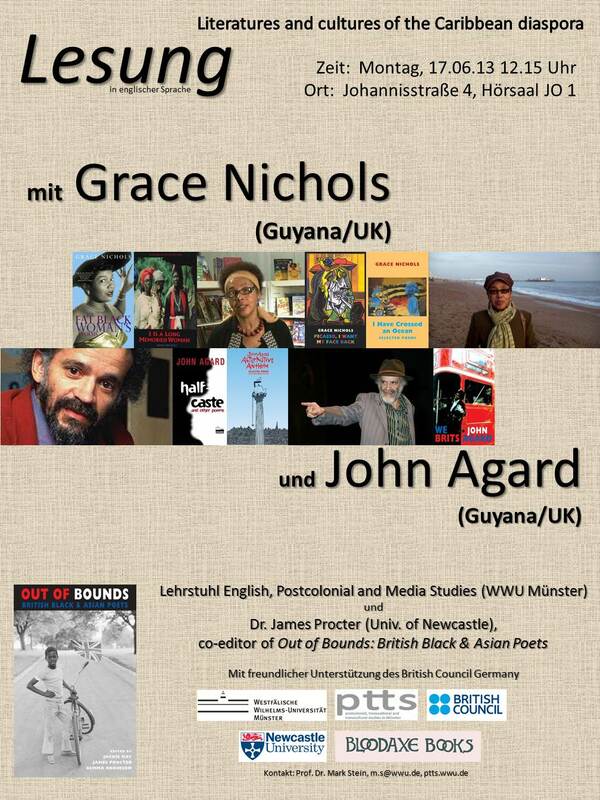 On September 29th, the University of Münster’s English Department and Wasafiri, the well-known magazine of international contemporary writing, will be co-hosting a literary reading event to celebrate Black and Asian British writing. The reading will feature authors Mike Phillips, Moniza Alvi, Kerry Young and Gabriel Gbadamosi. The event is open to the public and free of charge. Visitors are warmly welcomed. 3 May 2016 | 18:00 c.t. The large-scale mobility of people, goods and capital called “globalization” and the widespread use of global information technologies have given many language educators the impression that national cultures are on the wane and that in a global neoliberal economy “culture” has lost its explanatory power. In fact, quite the contrary is happening. Culture has become embedded in speakers’ and writers’ choice of words, their discourse style and their manipulation of codes, modes, stances and identities. Culture has become another word for historicity and subjectivity. 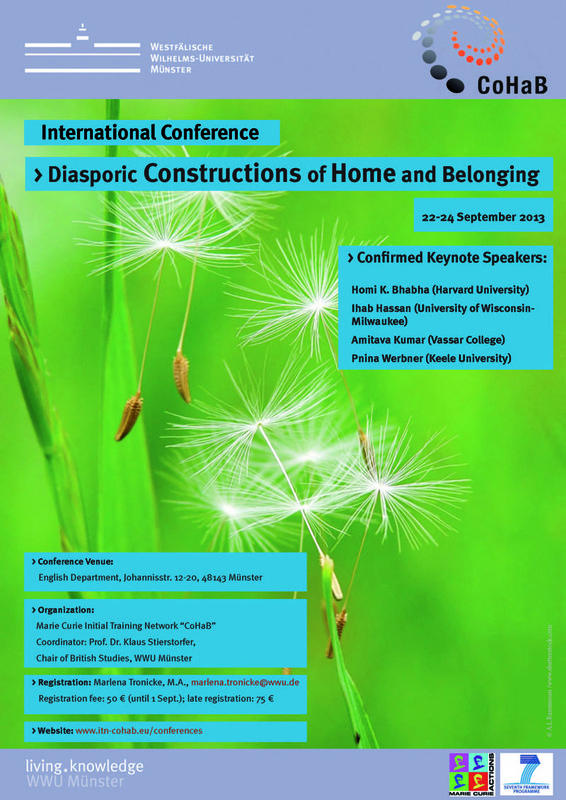 This paper will trace the development, in the last 25 years, of the teaching of language across cultures and the emergence of the notion of symbolic competence to account for today’s complex relation of language and culture in foreign language education. Tendai Huchu is a Zimbabwean author who lives in Edinburgh. His first novel, The Hairdresser of Harare, was released in 2010 to critical acclaim, and has been translated into German, French, Italian and Spanish. His short fiction in multiple genres and nonfiction have appeared in The Manchester Review, Ellery Queen’s Mystery Magazine, Gutter, Interzone, AfroSF, Wasafiri, Warscapes, The Africa Report and elsewhere. In 2013, he received a Hawthornden Fellowship, a Sacatar Fellowship, and was shortlisted for the 2014 Caine Prize. Tendai Huchu will be reading from his new novel, The Maestro, The Magistrate & The Mathematician. It pictures the struggle of three main characters with thoughts of belonging, loss, identity and love, as they attempt to find a place for themselves in Britain. The reading will be chaired by Deborah Nyangulu, who is a graduate of the MA NTS programme and a PhD student and lecturer at the Chair of English, Postcolonial, and Media Studies, WWU Münster <ptts.wwu.de>. TEFL Day is an annual one-day event organised by the Chair of TEFL and supported by the Zentrum für Lehrerbildung (ZfL Münster). 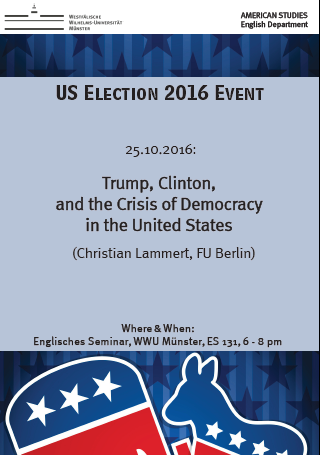 It takes place at the English Seminar of Münster University. Each TEFL Day moves into focus a current didactic concern, thus interweaving didactic theory with reflective practice of teaching English as a foreign language. The fourth TEFL Day will take place on Thursday, 10 March 2016. Why is my professor not black? Annual GAPS Conference (Gesellschaft für Anglophone Postkoloniale Studien, formerly GNEL) "Ideology in Postcolonial Texts and Contexts"
14. Afrika Festival Münster - "Business as usual? Unternehmergeist und Ideen aus Afrika"
April 9, 2014, 4 p.m. | April 10, 2014 3 p.m.
February 11, 2014 | 2:30 p.m. - 5 p.m. Writing in English: what does the advanced learner need to know? Professor Dr. Daniela Elsner, Goethe-Universität Frankfurt a. M.
"The Case of Coordinated Pronouns"
"Who would be a Poet Laureate?" Erste Graduiertentagung der Graduate School "Practices of Literature"
"Aesthetics and Social History in Late Colonial Plantation Architecture and Painting of the Early Republic, 1730-1800"